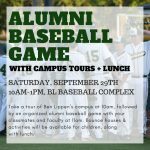 Come take a tour of Ben Lippen’s growing campus at 10 a.m. on Saturday, September 29, followed by an organized alumni baseball game with your classmates and faculty at 11 a.m.! Fun activities will be available for children along with a lunch. Please contact Margaret.Chase@BenLippen.com with any questions.